Singapore has ambitions to be a musical force in the world. With no less than three excellent tertiary institutons with exciting music programmes (including a conservatory which is making a reputation way beyond the boundaries of south east Asia), a specialist School of the Arts, a tremendously active concert culture, a handful of performance venues which impress by any standards, and a plethora of professional performers including a national orchestra – the Singapore Symphony – which sounds at times almost world class, it seems to be heading firmly in the right direction. There is, though, a very long way for Singapore to go along this journey. This is painfully obvious from the fact that music in schools is still generally regarded as a competitive activity intended to increase corporate prestige rather than an important element in enriching an individual’s artistic sensitivities - something reinforced by the total obsession Singapore music teachers have with the competitive culture inculcated by the graded music examination system. There are also some very attractive-looking performance venues which suffer from appalling acoustics, hopelessly inadequate pianos and a downright bad environment for the performing of and listening to music, while the vast majority of performing ensembles in Singapore can be cringe-mockingly poor - as, indeed, can the SSO on occasions - and not seem to be aware of it. However, the major barrier to overcome on the path to international credibility as a musical hub is the low expectations of audiences and, all too often, of those charged to lead, direct or observe musical performances. Audiences can’t be blamed; how can they know the difference between bad, mediocre, good and excellent if nobody guides them properly? I note a sad lack of the kind of Music Appreciation sessions which can so successfully be used to foster a proper perception of quality. Pre-concert talks, radio broadcasts focused on music, and educational introductions to music (either live or broadcast) are horrendously inconsistent – I’ve heard some fabulous ones, but rather more which are not just bad but fundamentally misguided – and audiences are so often subjected to the mediocre, that they assume it is the norm. They have no ambition to experience better, simply because they do not know it exists. As a critic, I take on a responsibility for trying to prompt audiences to recognise the mediocre, to appreciate the good and to seek out the excellent. While I often get abuse for it (I still chuckle at the memory of a blog post in which I criticised an audience in another country for rapturously applauding a terrible concert; I was inundated with abusive emails from members of a Singapore youth ensemble who assumed that I was referring to them) I also get some appeals for critical guidance from those Singapore musicians genuinely anxious to improve beyond the standards which are still common currency in Singapore. So I have to apologise to Singaporean countertenor Chan Wei En who asked me to attend a concert he gave last weekend and offer my opinions. He was hoping I might be able to offer suggestions for improvement. I made a few enquires beyond Singapore (he has been studying in the USA) and was told that I really had to hear him; that he was a very promising young countertenor. So I took a gamble and suggested to the Straits Times that his recital warranted a review in a public arena. They accepted and, in the event, there were no guidance points I could realistically offer him. I believe he is probably one of Singapore’s best young singers and one who has the potential to make waves on the world stage. Having said that, he also performed what for me was the most successful new work by any Singaporean composer that I have heard in recent years. 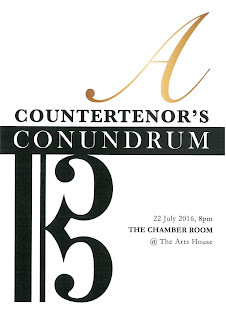 Chan Wei En never did tell us what the “Countertenor’s Conundrum” was, nor why he chose it as the title of his recital. Perhaps the conundrum is this – why does the most unnatural of singing voices sound so natural? Years of intense and strenuous training have brought Chan to the point where his voice sounds remarkably pure and his vocal delivery looks completely effortless. Technically there were a couple of tiny flaws revealed in this wide-ranging programme. Ornaments, always stylistically intended, did not always come across with complete delicacy in “Chi scopre al mio pensiero” from Handel’s Alcina, and the extraordinarily athletic vocal runs in Gluck’s “Addio a Miei Sospiri” (from Orfeo ed Euridice) had a slightly hard edge to them. But in every other respect, this was singing of the very highest technical calibre, superbly poised and magnificently controlled. Another conundrum is why do countertenors, as a breed, show so much more musical and artistic sensitivity than other voice ranges? Chan posed that conundrum with a vengeance - this was music-making of the most supremely high quality, intelligent, sensitive and powerfully communicative. If any of the current generation of Singaporean singers is to make waves on the international platform, I am convinced Chan Wei En will be the one. But without in any way denigrating the excellence of his performance, this recital would not have been the huge success it was without the sensitive, intelligent and beautifully crafted accompaniments of Jonathan Shin. His sense of empathy with both song texts and singer was, in itself, a work of art. But there was much more to Jonathan Shin than that. His own composition, The Other Merlion and Friends, a setting of five poems by Singapore’s Gwee Li Sui, was probably the most compelling and worthwhile new work from any Singaporean composer in recent years. He mirrored Gwee’s clever imagery, capturing the essential character of Singapore, with intelligent, original and distinctive music. This was obviously music of our time, but for all its intellectual challenge it possessed that elusive quality of accessibility. Naturally enough, Shin tackled the extremely virtuoso piano part with wonderful fluency, while Chan’s delivery of the complex vocal lines was nothing less than brilliant. "no less than three excellent tertiary institutons with exciting music programmes (including a conservatory which is making a reputation way beyond the boundaries of south east Asia)"
While I agree about the conservatory, I would hesitate to call any other tertiary institution in Singapore offering a music programme, "excellent"! As you remain anonymous I have no way of knowing whether you are a student, a teacher, a disinterested observer or just someone spinning a line. PLEASE make your comments worthwhile by telling us who you are and from what perspective you write. You ask whether I am a student, a teacher, a disinterested observer or just someone spinning a line. I am deeply hurt and can only respond to say that I am none of the above. I am perhaps the most prolific composer, writer, poet and painter in history, and with a creative output spanning far longer than any other polymath could hope to achieve. A great many compilations of music or poems have one or even several of my creations. So famous am I that Blogger has even provided an entry in the pick list specifically for me - no Kings, Presidents or Prime Ministers have such recognition and honour. So I am more than a little surprised that you do not recognise my name. Surprised and hurt. However, I can understand why my identify may confuse some people. After all - though my name is famous, non-one has yet identified my date of birth. And that is how I prefer to leave it !